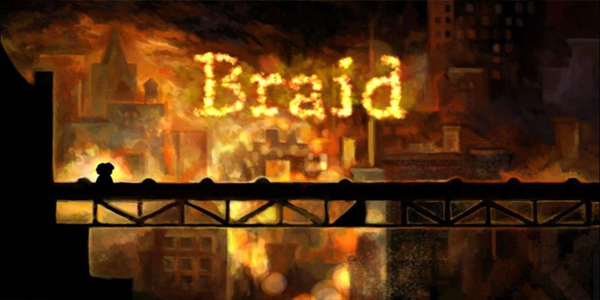 If I told you there was a game with the sole objective of building bridges, you might think I was crazy or that the game couldn’t possibly have any depth. 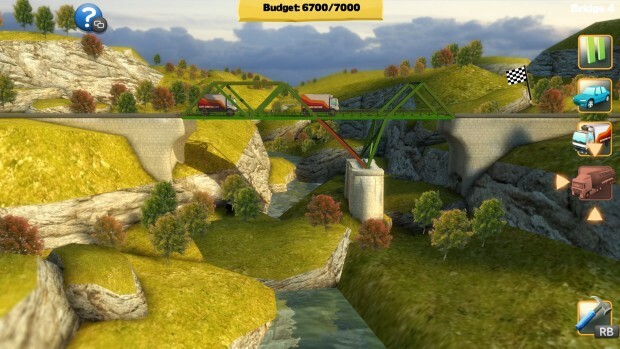 Well, Bridge Constructor looks to prove you wrong with its inventive take on civil engineering. The concept is simple: the player is given a few types of building materials, which can include wood, concrete, steel and reinforced wire, to construct a bridge to the other side. Each scenario has build points that can be used to start, and pieces attach to each other from there. The more difficult levels restrict these build points, along with materials types and their quantity. Once a bridge is constructed, traffic must be able to successfully pass to the other side to achieve success. Engineering made entertaining — The bridges start off simple. Single wooden A-frames lead to suspension bridges, then come levels with a great chasm where a suspension bridge would make sense, but is not available. Of course, the next logical step is to make a monstrosity out of wood and hope the nails and braces hold. These out-of-the-box designs allow the player to put a unique stamp on a level. Sometimes sacrificing symmetry and neatness is the only way to succeed, while other times an elaborate, elegant design can work just as well. London Bridge is falling down — That familiar sound of bending steel or collapsing wood may indeed signal the end of the player’s bridge, but it does not mean that the scenario is a total loss. Half the fun can be watching vehicles try their best to reach the other side, only to fall just shy of the finish line and come tumbling down with the remainders of the bridge. Exploding tanker trucks are especially satisfying, as they send out shock waves that further destroy the bridge. 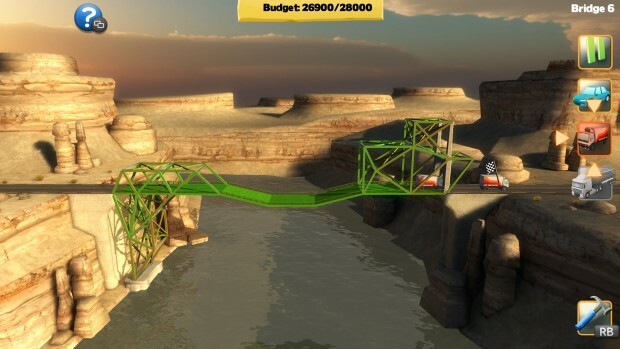 Clunky user interface — Before coming to Xbox One, Bridge Constructor was released on PC and mobile platforms, and that sure shows in its design. Using the stick on the controller to go from side to side and up and down on each panel is not intuitive at all. While everything is totally functional, it would have been nice to see some fine-tuning for the console release. Even the act of building bridges is slower than on other platforms because a mouse will always be faster for a game like this, but there is not much that can be done about that. A bridge too far — For the most part, the scenarios are fun and challenging. Materials can be limited to only one or two, with a low resource cap on top of that. This leads to inventive designs for bridges that look like they were dreamed up by Dr. Seuss. However, there are occasions where a logical design utterly fails, and something succeeds that should have never worked, or sometimes a challenge is too hard or restrictive, and the game ceases being fun. There have been bridges I’ve spent a long time building structural supports underneath and bracing supports on top, only to end in failure. What somehow saved me was only putting the road across the chasm, letting it sag and sending trucks across. How this unsupported wooden bridge didn’t collapse, I have no idea. 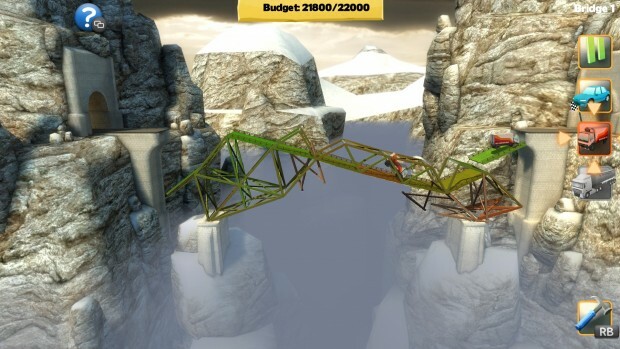 Bridge Constructor is not like other games, and that is simultaneously its greatest strength and weakness. While most players will undoubtedly love the freestyle emphasis the game pushes and its unique take on engineering, others may feel confined by the open-ended nature of the levels and hit a dead end because of a lack of a hint system. But Bridge Constructor gives players the freedom to build what they want, how they want it. 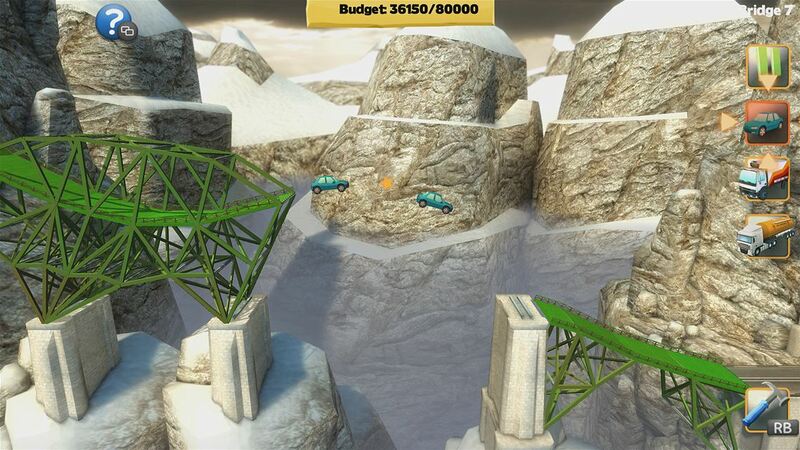 Bridge Constructor was developed by Clockstone STUDIO and published by Headup Games on Xbox One. It was released on August 21, 2015 for $9.99. 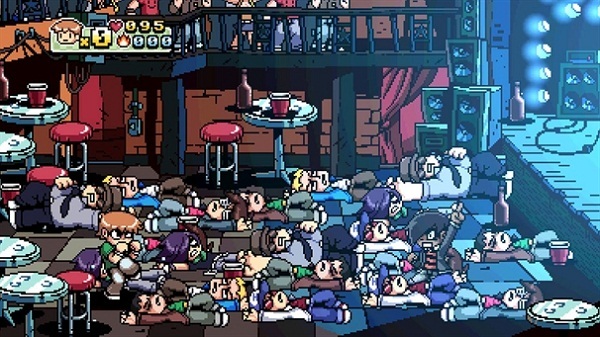 A copy was provided by Headup Games for review purposes.